I first became aware of Peter May’s books when I saw The Lewis Man in a bookshop when we were on holiday in Glencoe last September. I was drawn to it because of its title and its historical reference – a man found buried in a peat bog on the Isle of Lewis. 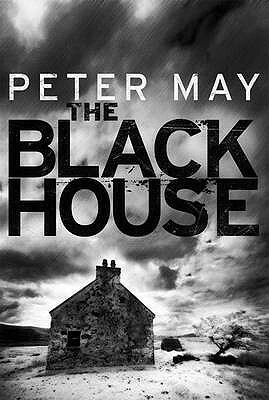 But when I realised that it was the second in a trilogy I decided to read the first book first and it’s only been in these last few weeks that I’ve borrowed The Blackhouse from the library and read it. As I was reading The Blackhouse I wasn’t sure how to categorise it. There’s a murder and a mystery, an investigation by the police, but most of the book is not really a detective story, or a police procedural. It’s very slow reading and I had to lower my expectations of getting to grips with solving the murder mystery, because that is not the main element of this book and actually it’s not too difficult to work out who the murderer is. I liked it very much, although I nearly stopped reading when I got to the description of the post mortem – I don’t like gruesome! It was a particularly brutal killing. But I’m glad I carried on and settled into the rhythm of the book. I loved the dramatic setting on the Isle of Lewis in the Outer Hebrides and wished this book had a map as the geography of the island plays an important part in the story (I see the last book in the trilogy, The Chessmen, does have a map!). But Peter May’s descriptions convey the atmosphere and bring the scenes to life beautifully and vividly. Detective Fin Macleod is seconded from the Edinburgh police force to help with the investigation into the murder in the village of Crobost on Lewis because it bears a resemblance to a similar murder in Edinburgh and Fin was born and brought up on Lewis, so he knows the people and speaks Gaelic. As the story unfolds, the narrative splits in two – one, set in the present day, follows the murder investigation (told in the third person) and the other, (told in the first person) as Fin recalls the events of his childhood and remembers his friends – some of whom are still living on Lewis. These include his best friend, Artair, his first girlfriend, Marsaili and the school bully (and murder victim) Angus Macritichie, known as Angel. Fin’s memories are not all happy ones and include the time he took part in the traditional annual two week trip to An Sgeir, the rock fifty miles north-north-east of Lewis to harvest the guga, or young gannets. Twelve men from Crobost still carried on the four hundred year tradition, living rough on the rock, clambering over the cliffs to snare and kill the young birds. It’s in passages like these, that are vital to the plot and yet seemingly buried in Fin’s mind, that May excels. The book gathers pace as it reaches its conclusion, in comparison to the almost leisurely story-telling of the earlier sections, as the drama and tension increase. Fin not only uncovers the identity of the murderer but also discovers things about himself either that he hadn’t known before or had buried deep within his mind. Things that turn his world upside down for ever. I liked it so much that almost immediately I began The Lewis Man, which so far is equally as good. So glad you enjoyed this, I’m not familiar with the author or his works but I shall check them out. I must get to The Lewis Man as well. I was knocked out by The Blackhouse. Joanna Roberts liked this on Facebook. Margaret – It’s interesting how some books are like that; they sneak up on you in a manner of speaking. I’m glad you ended up liking this one. A lesson here: sometimes you just need to stick with a book to appreciate it, even if it has components that you usually don’t like. I’m having the same problem with the book I’m reading now, a Jo Nesbo. I enjoyed The Black House so very much also. I’ve been trying to find The Lewis Man over here, without luck so far, or else I would have started it already. I thought the characters were superbly drawn, and the action pulls the reader along, and especially the story itself, and how the past knocks down into the future, one of the best mysteries so far this year.